Queer Arts Show organizers Alana Mendoza and Winter Smiley in Adams Plaza on Wednesday, Feb. 28, 2018. Since fall semester of 2017, Mills students Alana Mendoza and Winter Smiley have been organizing an art show to hold space for queer artists and their work. Independent of any club or on-campus group, these first-years are hunting for potential venues outside of Mills and fundraising. 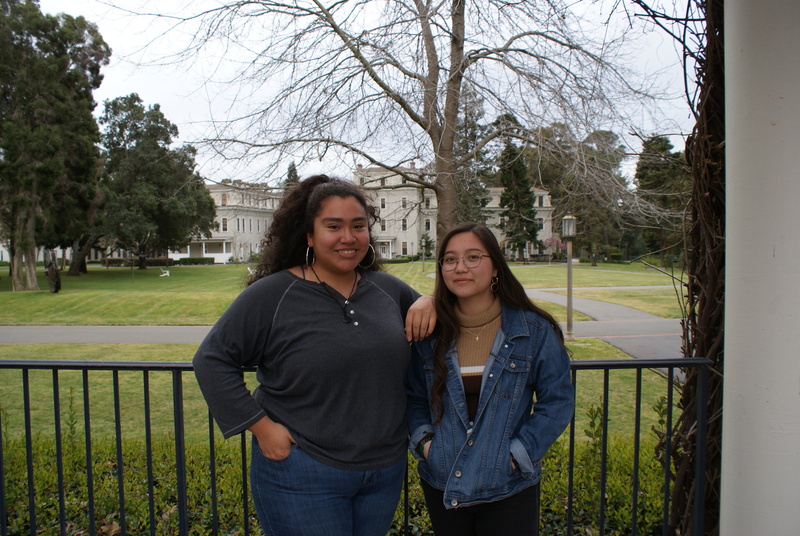 When lack of sponsorship or club affiliation prevented them from reserving a location on campus, Smiley and Mendoza were compelled to search elsewhere, but the biggest challenge lies in raising money. They plan to accumulate enough funding to book the event, but ideally, they hope to raise enough to compensate the artists who participate. Smiley emphasizes that, even in spaces which focus on the work of queer artists, particularly those of color, absence of payment is a common problem. “They’re just exploiting us for our labor and our identities,” Smiley said. 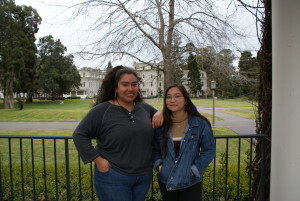 Mendoza engages in many artistic outlets, such as doodling and writing, but is most enthusiastic about music and musical experimentation. Smiley’s passions stretch from designing zines to photography and film. Currently, they co-run an online publication called They/Us Press, which Smiley founded. The diversity of their creative interests will be reflected in the art show itself. In fact, they express that all types of art will be welcome, and that they would like to hold a space that can accommodate multimedia as well as live performances. “People often forget who is included in the umbrella of queer, and I think that it’s important for people to showcase themselves because there’s more to queerness than just being gay and lesbian,” Mendoza said. “That’s why I feel artists don’t believe they’re artists. It’s like ‘oh, this isn’t good, this isn’t to that level.’ It doesn’t matter, you created it, for yourself, for your experience, to just express yourself,” Mendoza said. The purpose of the show is to give queer artists a space to showcase themselves and their work in an intimate and expressive environment. For more information about how to support the queer arts show, contact Alana Mendoza at almendoza@mills.edu and Winter Smiley at wsmiley@mills.edu.